Portuguese violist João Camões marks with Autres Paysages his third collaborative project with French synthesist Jean-Marc Foussat, known also as in-demand sound engineer trusted by Joëlle Léandre, Steve Lacy and many others. On this set of three extended electro-acoustic improvisations Camões and Foussat are joined by French trumpeter and flugelhorn player Jean-Luc Cappozzo, known for his free-improv collaborations with Léandre, Herb Robertson and Gerry Hemingway, but also as one that was invited by Dizzy Gillespie to play with him in concert. “L'espace Qui Nous Separe” that opens Autres Paysages set the atmosphere - a collective, chamber interplay, delicate and restrained one, that navigates freely between aspects of contemporary classical and experimental music with all the weight of the history of jazz. Cappozzo adds a warm, lyrical dimension that contracts the cerebral and restless tone of Camões and the alien, chilly noises of Foussat. Mid-piece, Cappozzo plays the harmonic flute and Camões adds the myr, an ancient Turkish double reed woodwind instrument, and the atmosphere becomes more dense and tense. The second piece, “De Tes Yeux Aux Miens” is more suggestive. Camões, Cappozzo and Foussat search for new sounds and dynamics, employing extended bowing and breathing techniques. This suggestive piece shifts between abstract, moody phases, some are quite tense, others more cinematic, just as in a dream-like state. 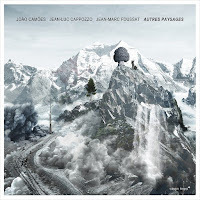 Again, it is Cappozzo who charges this piece with an emotional, melodic core and later even playful playing that balances the tough, uncompromising approach of Camões and Foussat. Foussat offers more weird yet familiar sounds on the last “Berceuse Pour Manuel” - distant dogs barking and bird calls, and together with the flute of Cappozzo and the myr of Camões this piece shifts to exotic, enigmatic terrains, deepening the dreamy mode of this unique trio and its sparse, poetic interplay.